Beach totes are the in-thing right now and you probably have a whole range in your closet. But, there is always space for one more, especially when it is as gorgeous as this one! Inspired by artist Paul Brent, featuring his coastal life scenes. Manufactured from cotton which is strong and durable, our bag sports a classic design of Adirondack chairs and umbrella on the beach. Reverse side has an equally colorful vertical stripe in red, lime and blues. The ample size makes it ideal to fill with all the goodies you need for a day on the beach or lazing by the pool. Long handles allow for easy carrying over your shoulder. Add a personal touch and allow us to embroider your initials. 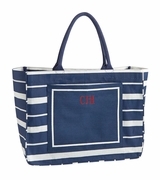 Designer beach tote bags features interior lining, one zip inside pocket. Measures 18" x 14" x 4" across the bottom. Zipper closure.